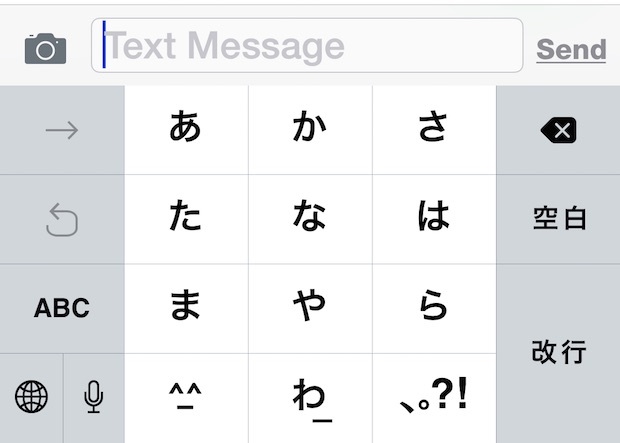 Whether you’re a multilingual iPhone or iPad user or just learning a foreign language, you almost certainly wish to change the language of the onscreen virtual keyboard from time to time. Switching the keyboard language in iOS is really quite simple once you have an alternate keyboard enabled, so let’s walk through the entire process. 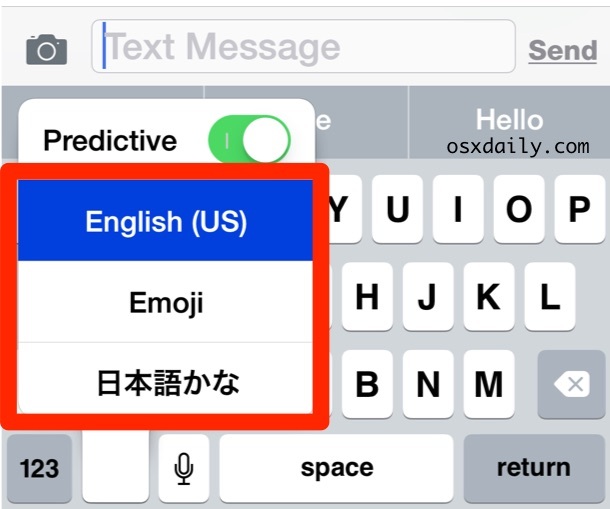 Before anything else, you’ll probably want to enable an alternate language keyboard if you haven’t done so yet. This allows you to type in another language using that languages keyboard without changing the language entirely in iOS. We’ll assume you’ve already added at least one alternate language keyboard this way, but for the sake of trying out the keyboard switching you can even just enable and use the glyph and symbol keyboard or the Emoji keyboard. Note that in modern versions of iOS, when you have more than one alternate keyboard language enabled, the familiar smiley face Emoji icon on the keyboard gets switched out with a Globe icon, which is actually the same with what the Emoji and language access looked like in prior versions of iOS. The chosen keyboard language immediately becomes active. 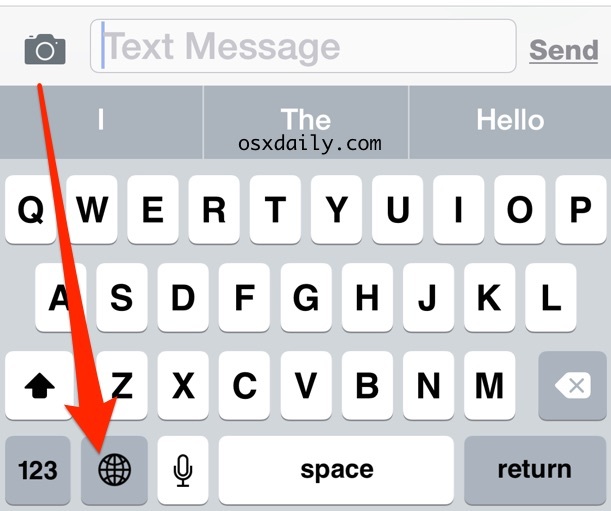 Note that you must tap and hold on the globe icon to reveal the alternate language keyboards. Simply tapping the smiley-face icon once typically just switches to the Emoji keys. You can switch back or change the iOS onscreen keyboard at any time quickly by performing the same tap-and-hold trick on the globe icon at the keyboard, and you can do this anytime the keyboard is visible on the iPhone, iPad, or iPod touch. Mac users have a similar way to switch the keyboard language in OS X with a quick shortcut, so if you’re a polyglot with a variety of different Apple hardware, you should be covered with whatever OS you’re using. In reference to today’s email about using the Glyphboard – you stated that it only works in iOS, but if you click on the link on a Mac, you can also copy and paste from Safari to a Pages document. The keyboard layout you added will be included in the list. To set the new layout as your default, select it from the list. I changed the keyboard to Hungarian, but how do I get the speling right? Please help. I was able to switch keyboards but somehow I can’t access letters of the alphabet with accents as needed in Spanish and other languages. I see them when I hold down the key with the letter I need but somehow I can’t select a vowel with the accent. When I press it it simply types the vowel without an accent. What am I doing wrong? on iOS keyboard, you have to press and hold on the accent letter, say it’s an “A” then you tap and hold on “A” then continue pressing and slide over to the “A” accented version you are looking for, like “Ã” for example. I recently got an iPad next to my iPhone. On the iPhone I can see which language is currently being used because the space bar has “space” written on it (or “spatie for Dutch, “espaço” for Portuguese, etc. On the iPad no such identification is shown, despite there being ample space to do so. Is this intentionally? Is there a setting I can use, because I find it really annoying? After back up my iPhone 7+, I had lost the Persian keyboard on my phone, I couldn’t able to find the Persian alphabet on the lis. Where I can find the Persian alphabet on my phone. Doesn’t work. Added French. Only options offered: English & emoji. Actually changing keyboards is a feature of the iOS Keyboard, it is built into iOS. It can’t not work, it doesn’t break down or fail. It’s a *feature*, are you aware of what that is? In other words, it works for everyone but you Mdeva, that suggests you aren’t following the instructions and the problem is with you. I have iPhone 6S. Why Estonian keyboard template does not work properly. It does not show all letters.